Valentine’s Day is next week… next week you guys! Between a quick trip and illnesses, I feel like I’m completely off my game and that Valentine’s Day is going to pass us by this year. However, I am trying very hard not to let that happen which brings us to Hedgehugs by Lucy Tapper and Steve Wilson. If you’ve never heard of this book…RUN to your nearest library or Amazon and check it out. It is quite possibly the cutest little love story I’ve ever read with the most loveable characters. And that’s why it is our absolute favorite Valentine’s Day book… one that we read all year-long! Valentine’s Day for us is about spending time with the ones we love, showing our friends and family we care, and making memories. That is exactly what these two adorable hedgehogs do in the story. So, today I not only wanted to recommend this fantastic book to you, I also wanted to share with you some simple, yet incredibly fun ways to spend time with your little ones this Valentine’s Day… Hedgehog style. Horace and Hattie like to make Daisy chains in the shade of an old oak tree. Now I don’t know about you but it’s cold here for Valentine’s Day and Daisy’s are in short supply so instead you can create a Flower Hat. Sentence strips or construction paper cut to fit around head. 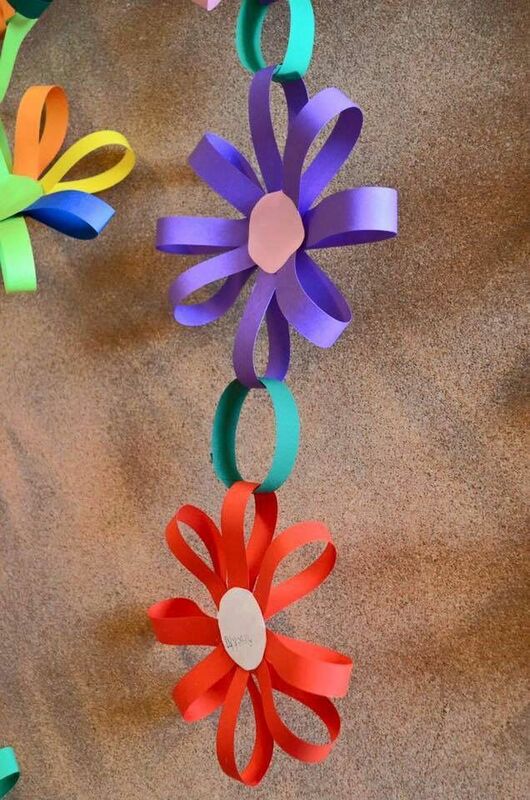 OR if you are super crafty check out this amazing flower chain made completely with construction paper. Those adorable Hedgehogs love to splash in puddles. So put on your galoshes, rain boots, or snow boots (depending on where you live) and head outside for some puddle jumping and splashing just like our good friends Horace and Hattie. Now if you’ve read this blog for a while you know that I love a good nature walk and as it turns out so do Horace and Hattie. So even though flowers and spiders may not be easy to spot I’m sure you can dance in the woods or spot some critters hiding out. Then discuss how each feels and whether that would be fun to hug or not! Again tea parties by the river may be a bit chilly this time of year, but you can certainly curl up on a blanket inside with Hedgehugs and have a wonderful tea party. Add some background water sounds to set the mood! Horace and Hattie are finally able to get the hug they’ve always wanted when they discover socks! Create your very own Horace and Hattie sock puppets and act out the story. Since those silly hedgehogs love socks so much have some fun sorting your socks to make sure you aren’t missing any. If you are you know that somewhere two hedgehogs are hugging! So there you have it! Simple but super fun activities that you can use all week long with the delightful book Hedgehugs this Valentine’s Day or really any time of year! I hope you and your kiddos have a wonderful Valentine’s Day!